Since the great Kennedy-Nixon US Presidential debate of 1960, the spectre of a televised debate – for that is how it must have appeared to many a Party leader – has loomed large over nearly every UK general election. For 50 years, however, British politicians have clung doggedly to the staid approach of the Party Political Broadcast – until this month, of course. You’ll then get the best actor as leader of the country and the actor will be prompted by a scriptwriter (Sir Alec Douglas-Home, in interview with Michael Cockerell, 2010). However, once Wilson was himself PM, he turned down Edward Heath’s challenge to a 1970 debate – a pattern which was to endure until John Major offered one to Tony Blair in 1997. Despite the PMs’ reluctance, the first ever televised debate took place 25 years ago –at the height of the referendum debate over Britain’s continued membership of the EEC. Leading politicians from the three major parties locked horns in three televised debates, and many of them secured their reputations as great orators. 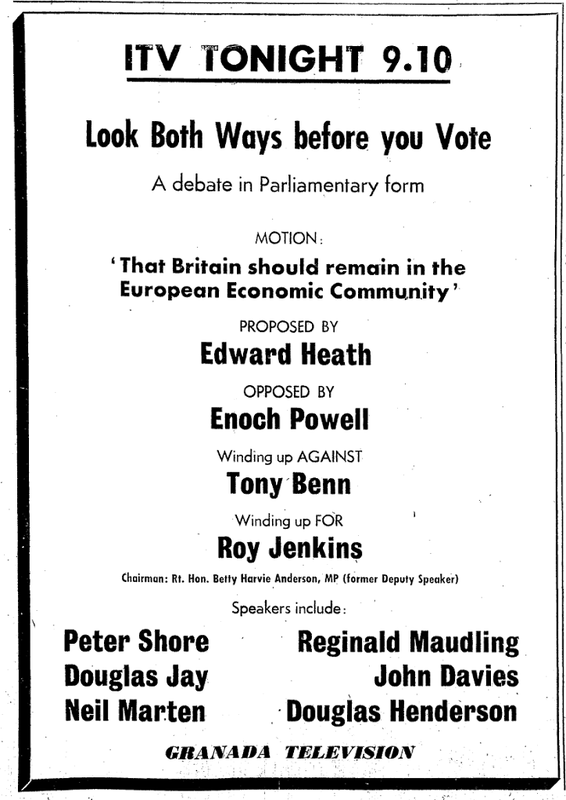 On 2 June 1975, Tony Benn and Roy Jenkins, both members of the Labour Cabinet, took opposing sides in a one-on-one debate for BBC1’s Panorama. That same evening, ITV presented a parliamentary-style debate on the motion ‘That Britain should remain in the European Economic Community’. 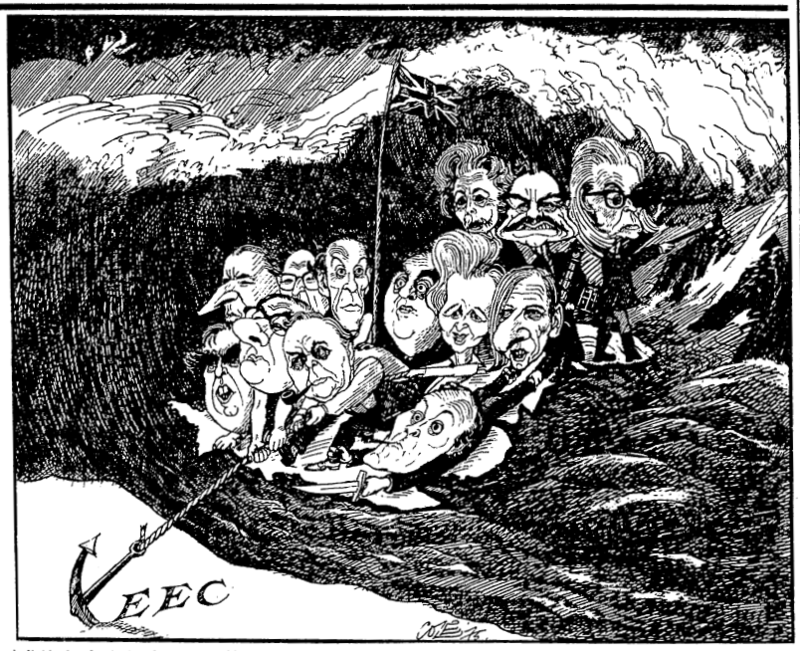 The motion was proposed by Edward Heath, supported by Roy Jenkins, and opposed by Enoch Powell, supported by Tony Benn (although the latter was subsequently replaced on account of his refusal to share a cross-Party platform). 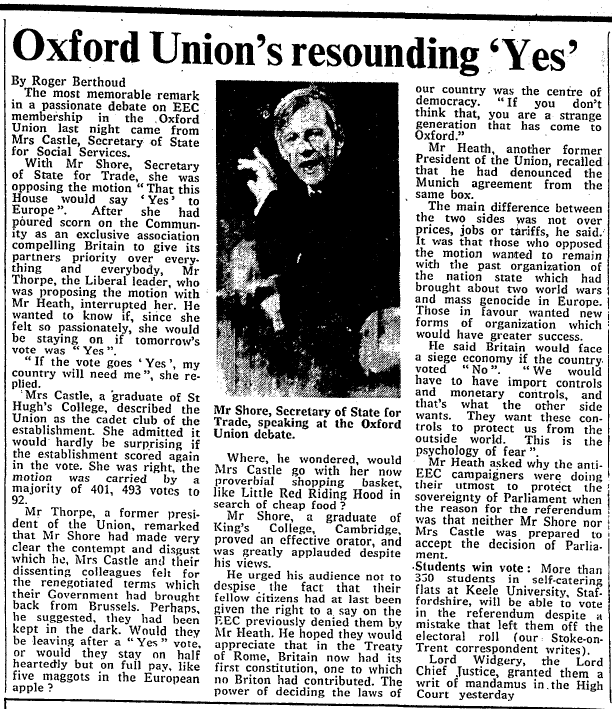 The following night, BBC1 broadcast an Oxford Union debate on the motion, ‘That this House would say “Yes” to Europe’, with Edward Heath and Jeremy Thorpe lined up against Barbara Castle and Peter Shore. In 2010, these same concerns would be the subject of six months’ deliberations between the parties and a detailed 76-point agreement.